MANILA, Philippines (CNS) — Bishops in southern Philippines have condemned rebels’ use of hostages as human shields in gunfights with government troops. The gunfights have escalated since Sept. 9 after hundreds of Moro National Liberation Front fighters reportedly attacked government troops who were securing five coastal districts in Zamboanga. The military reported Sept. 13 that at least 18 people had been killed, 11 of them rebels and the rest were soldiers, policemen and two civilians. 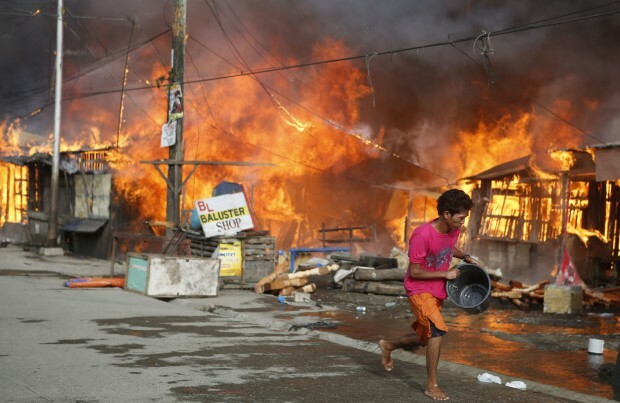 A Philippines Army official reported that 28 soldiers, six policemen and 18 civilians had been wounded in clashes in Zamboanga and in Basilan province, where the fighting had spread. Among the more than 100 hostages held by the rebels was Father Michael Ufana, who was visiting family members in Santa Catalina when the MNLF members arrived. Msgr. Crisologo Manongas, administrator of Zamboanga Archdiocese, reported over church-run radio Veritas 846 that the rebels had freed Father Ufana Sept. 13. However, the rebels continued to hold his father and scores of other hostages. The priest’s mother and two siblings escaped during gunfights Sept. 12, the Catholic Bishops’ Conference of the Philippines reported. Msgr. Manongas said he spoke to Father Ufana by phone immediately after his release and described him to be “in good spirits,” though “still worried about his father” and the other hostages. One news photo showed hostages rounded up in a street with a rope tied around the group supposedly to protect MNLF as they moved around. Zamboanga Archdiocese’s social action director appealed over Veritas 846 for relief goods, saying supplies were running low for thousands of evacuees. In their Sept. 13 statement, 17 bishops and Msgr. Manongas expressed “our solidarity with all those affected, Muslims and Christians.” They said “this terrible tragedy to human life and property” saddened them. “We condemn the terror that has been inflicted on an entire city. We condemn the inhumane act of using hostages as human shields,” the church leaders said in an appeal to the rebels to negotiate for the release of the hostages. “We appeal to the government, NGOs, religious groups, and civil society to provide assistance to evacuees,” they added. The bishops wanted to express solidarity with the affected people and were concerned about the “long-term repercussion” of the standoff, he said. Bishop Martin Jumoad of Isabela told CNS that fighting had reached remote towns of his prelature located between Zamboanga and Sulu. He said he and two other Christians are members of a crisis committee in Basilan that began meeting prior to the outbreak of fighting. He echoed the church leaders’ remark in their statement on the Zamboanga crisis. “Last Sept. 7, we joined Pope Francis in a day of prayer and penance for world peace, particularly in the war-torn country of Syria. Now we also offer our prayers for peace in Mindanao,” he said.